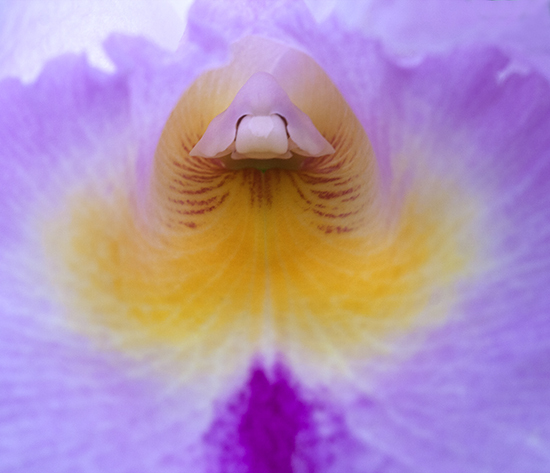 I’m finally finishing up with the shots from my trip last weekend to see the orchid exhibition and thought I’d post a couple of abstract images. 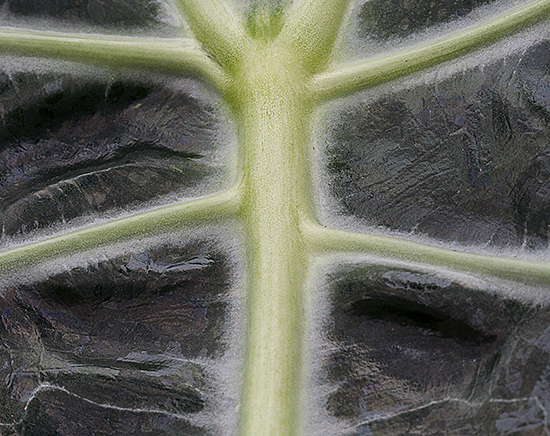 The first shot is a close-up of an elephant ear plant. I like the way its veins pop out, like a bodybuilder with a heavy weight. The image is somewhat symmetrical, but the two sides are not mirror images. 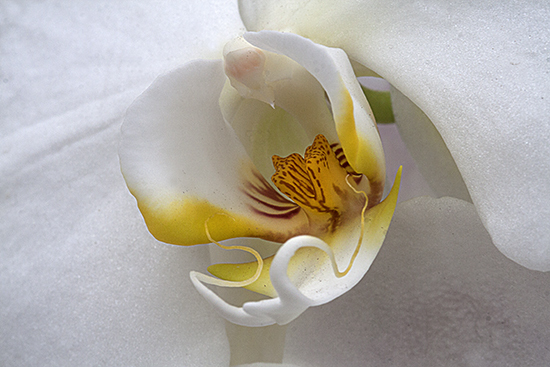 The second shot is a close-up of an orchid. Is it just me, or does it look like the flower contains a pink Darth Vader helmet? 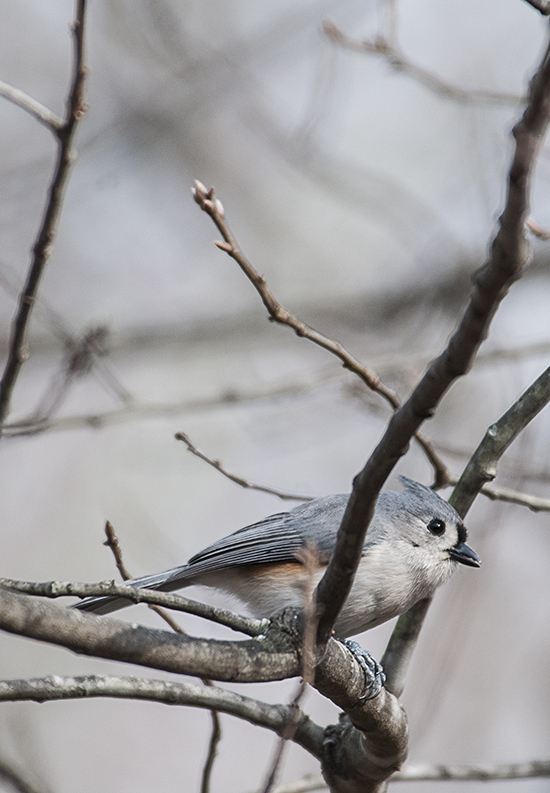 Borrowing a longer telephoto lens earlier this week, I was able to get some shots of the tiny birds that I often see, but rarely am able to photograph. 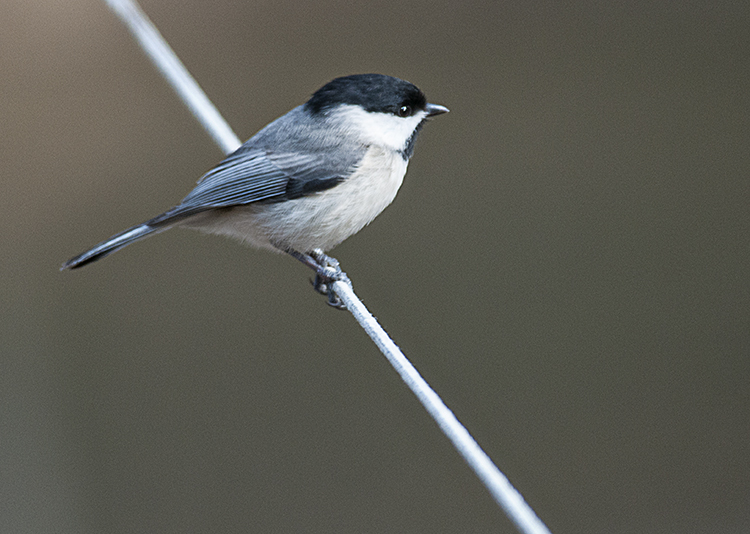 On Monday, my photography mentor, Cindy Dyer, lent me a Nikon D300 with a Nikon 80-400mm lens. It was a lot of fun to experiment with a much longer telephoto than I am accustomed to using. 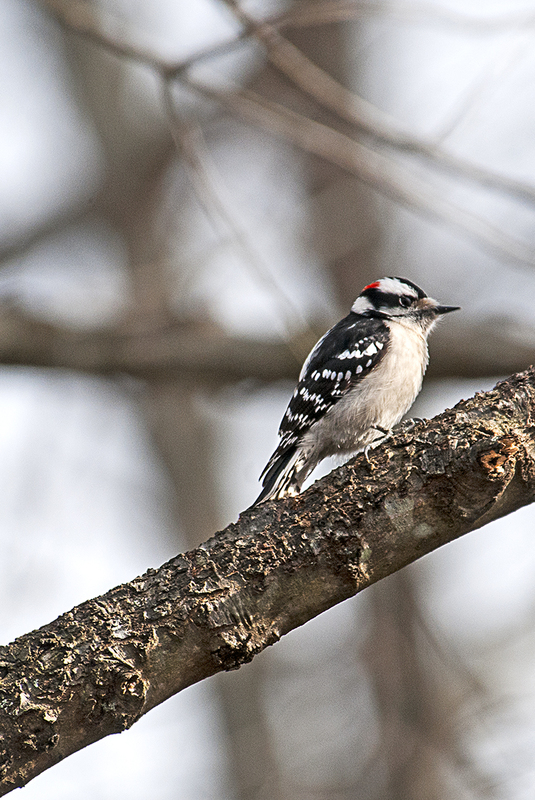 We spent only a limited time at a local nature center, so I did not have a chance to photograph anything too exotic, but I did get some shots of a Downy Woodpecker (Picoides pubescens), a Black-capped Chickadee (Poecile atricapillus), and a Tufted Titmouse (Baeolophus bicolor). The background in the first image really grabbed my attention when I pulled up the image on the computer—the tree branches look an awful lot like a suspension bridge. 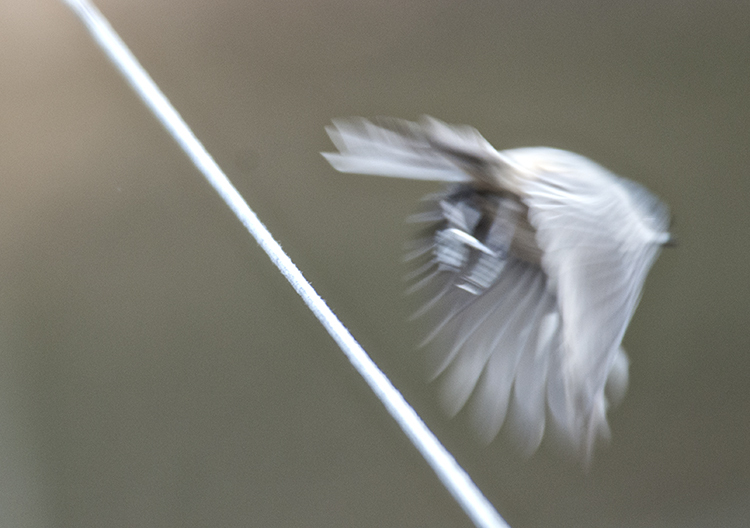 I included the blurry final image of the chickadee flying away just for fun. 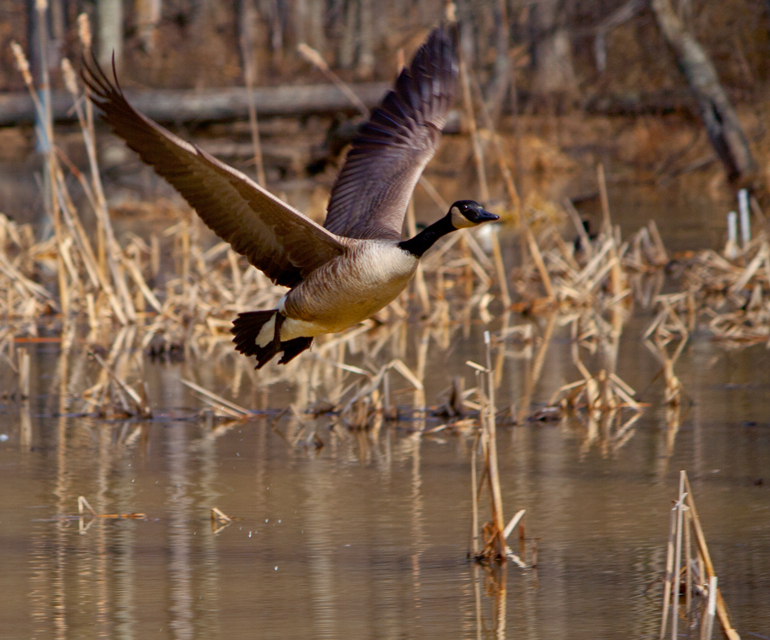 I get this kind of image on a regular basis, although usually the bird is out of the frame. 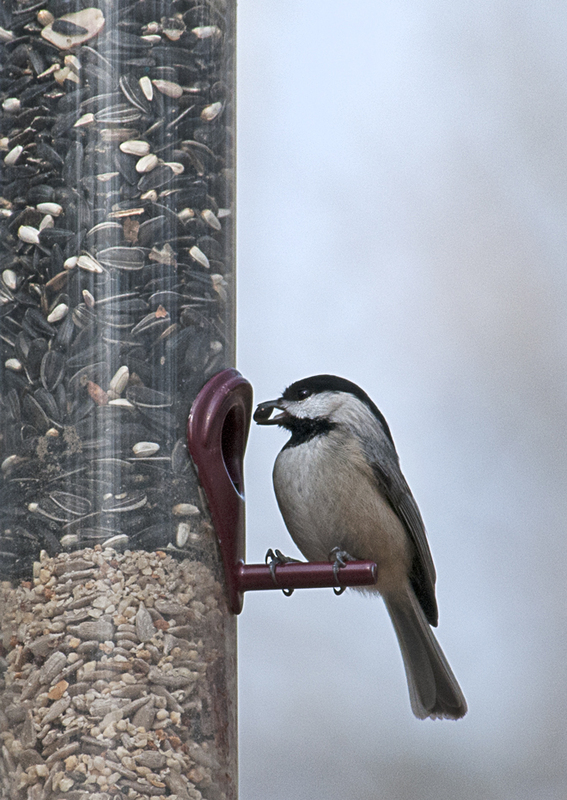 The Nikon I was using has a much higher frame rate (up to 7 images a second) than my Canon (a more modest three frames a second), so the chickadee is still in the frame. I am pretty sure that I will stick with Canon and not switch to Nikon, but, as fellow blogger Lyle Krahn predicted, I am starting to hear the siren call of a longer lens. Lately I have been playing around with the auto-focus settings on my camera, trying to figure out how they work and deciding when it is appropriate to use each of the modes. Next I decided to experiment with AI Servo mode, which is supposed to be the best mode for moving subjects. Previously, I had been shooting in One Shot mode or AI Focus (which is a hybrid mode). Most of the time, that meant I had to achieve focus separately for each image. I am still having some difficulties with the Servo mode, in part because it’s hard to know for sure if the focus has locked on the subject, since, unlike the other modes, the camera will shoot even if nothing is in focus. The way that it is supposed to work is that you focus on the subject with the center focus point for 1-2 seconds and then the camera will follow that subject as it moves. 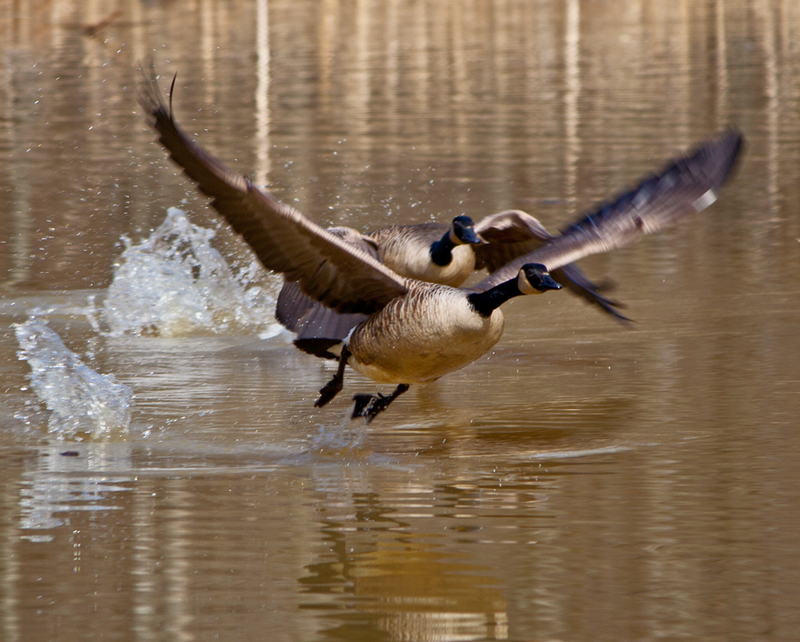 In the situation below, I focused on the front goose that looked like he was about to take off. When he took off, I took a sequence of six photos, only two of which were in focus. They were the second and fifth in the sequence and they came out pretty sharp. I may be overtaxing my ancient Canon Rebel XT by shooting in RAW, shooting bursts, and having the autofocus engaged continuously. Still, it’s fascinating to experiment with the different settings and see what works best for me. 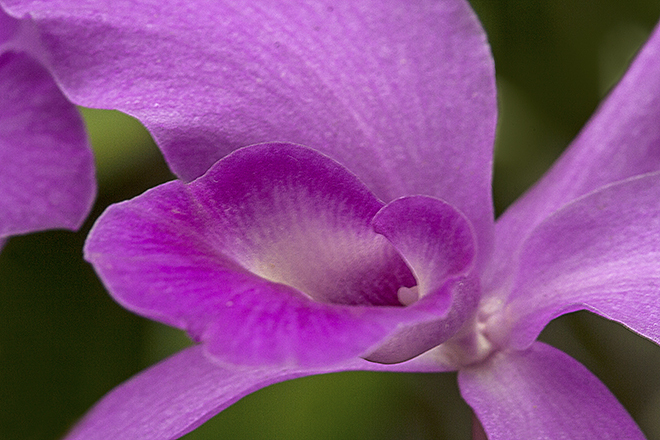 My challenge this weekend was to capture the delicate beauty of a wide variety of orchids and I decided that the best way to do so was to look at them closely, very closely and to use my macro lens. I took these photos at an orchid exhibition at Lewis Ginter Botanical Gardens in Richmond, VA, about 90 minutes from where I live. 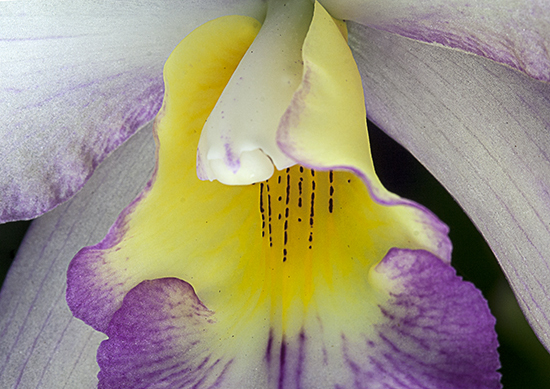 The orchids were displayed in a glassed-in conservatory at varying heights in many different ways at varying heights—sometimes as single plants and sometimes in groups. It would have been amusing to make a video of my body’s contorted positions as I struggled to frame the photos and to look through the viewfinder of my camera, which was on a tripod most of the time. In some of these images, like the first one, I tried to increase the depth of field to show more details and in other cases, like the last image, I intentionally limited the depth of field to capture one element. In some photos, I was most interested in the lines and colors. If forced to choose a favorite, I’d probably select the first image, because of the interesting shapes, which are set off by the white petals. Do you have a preference? 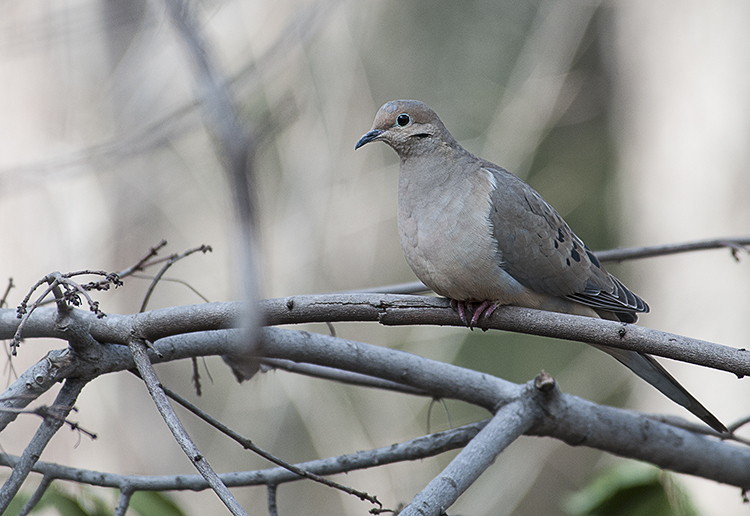 Using a borrowed Nikon D300 camera with an 80-400mm lens, I was able to get a lot closer to birds than I am used to, permitting me to to get shots like these ones of a Mourning Dove (Zenaida macroura). I, on the other hand, was eager to play around with the camera that she had lent me. Most often I shoot with a Canon Rebel XT and a 55-250mm zoom lens. It is a lightweight combination that has served me well, but it has some limitations. Cindy shoots with Nikon gear and is a self-professed “gadget girl,” so she had more than enough gear to share. It took a while to get used to the settings on the Nikon, but the real challenge was learning to shoot with the large lens. My hands and arms were not used to the weight of such a lens and I definitely would need a lot more practice to take fuller advantage of its capabilities (and I probably should have put aside my male ego and followed Cindy’s recommendation to put the camera on a tripod). 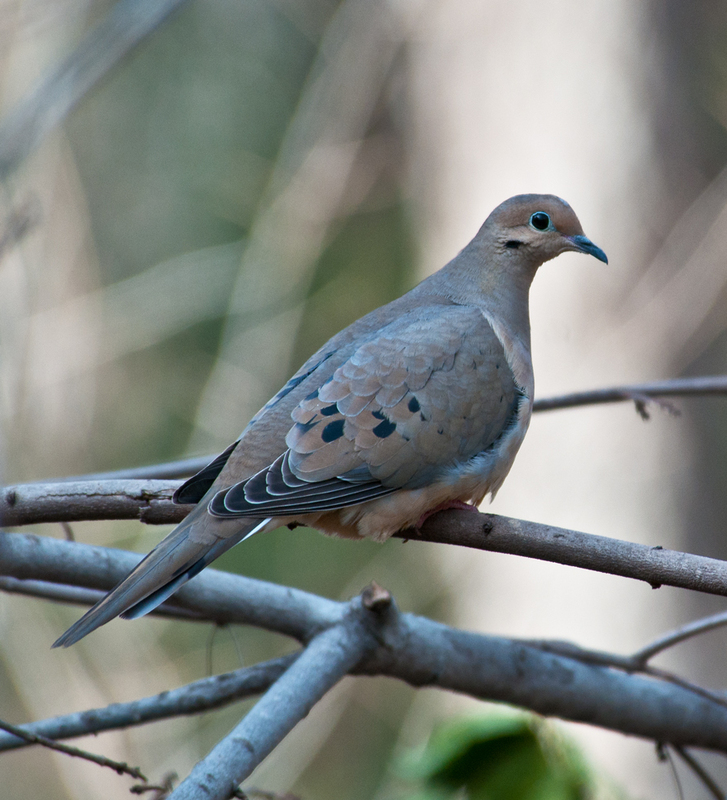 Here are two images of a Mourning Dove that I photographed. Cindy tweaked the first one in Photoshop and it is striking to see how she was able to bring out the details in the dove. I produced the second image, working in Photoshop Elements. The starting images may have been of equal quality, but it is clear to me that Cindy’s greater experience in Photoshop helped her produce a superior final image in a shorter period of time. What did I learn? Well, I think that the most important lesson to me is the value of constant practice, whether it be in using camera equipment or in using photo software. 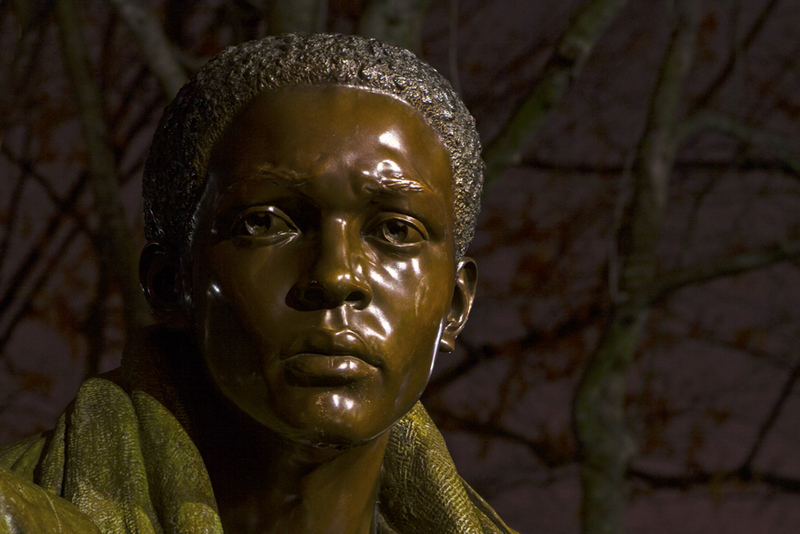 There are always new things to learn—and that helps to keep me energized about my photography. 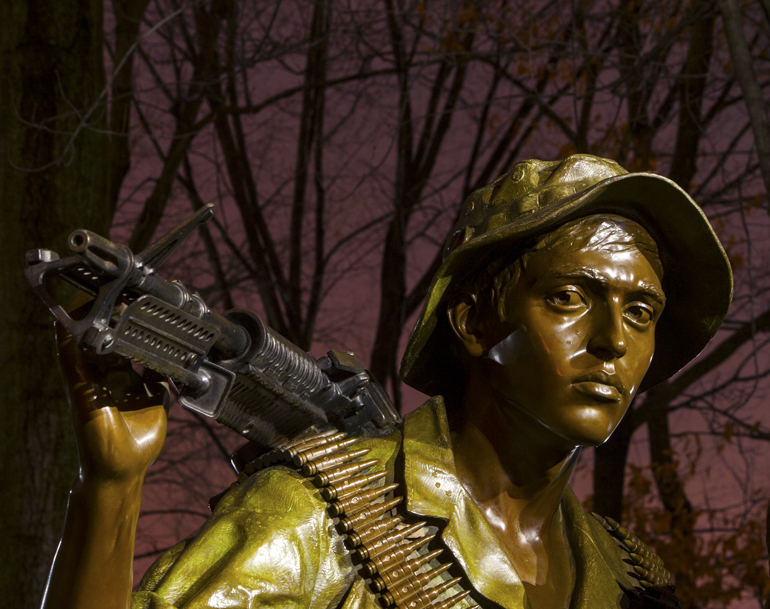 When most people think of the Vietnam Veterans Memorial, they think only of the black granite wall with all of the names, but the Three Servicemen Statue is also part of the memorial. 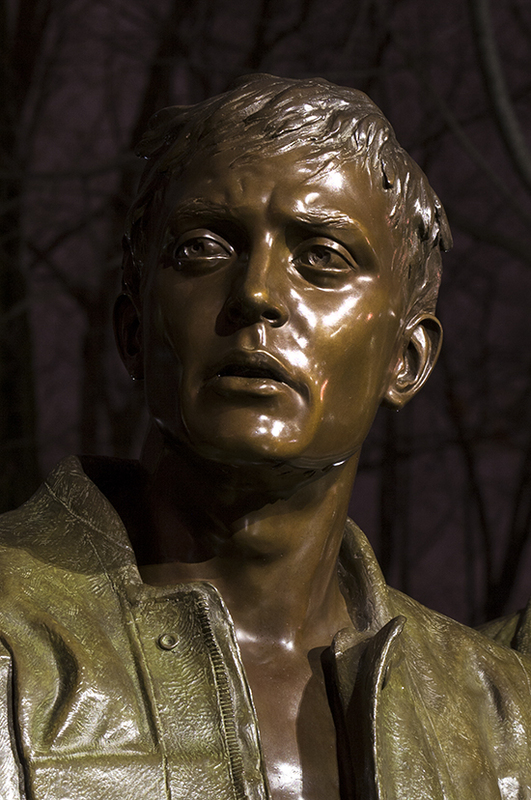 I visited the memorial one evening this past weekend and took these photos of the statue. 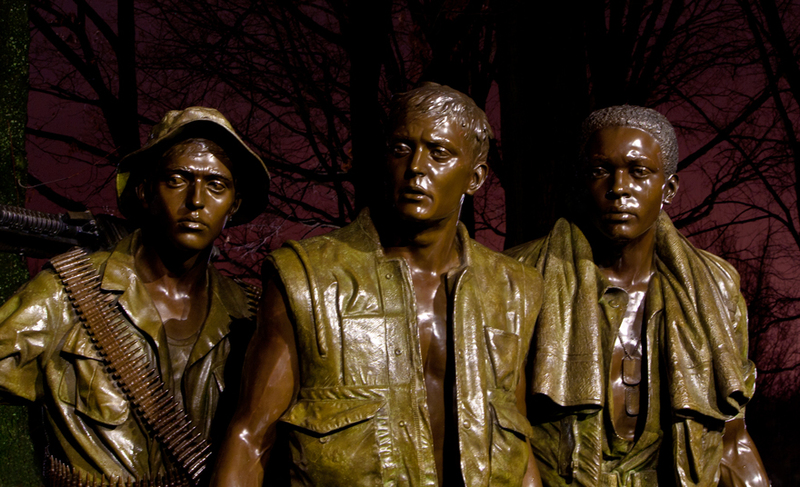 The first photo shows the torsos of the grouping (the statues themselves are full body, but I wanted to show the details of the upper bodies) and the others show the faces of each of the three soldiers. 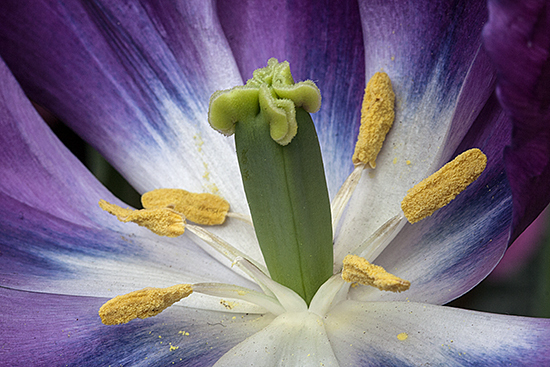 Here is a splash of color to start the work week—a close-up shot of the inside of a deep purple tulip called Negrita. 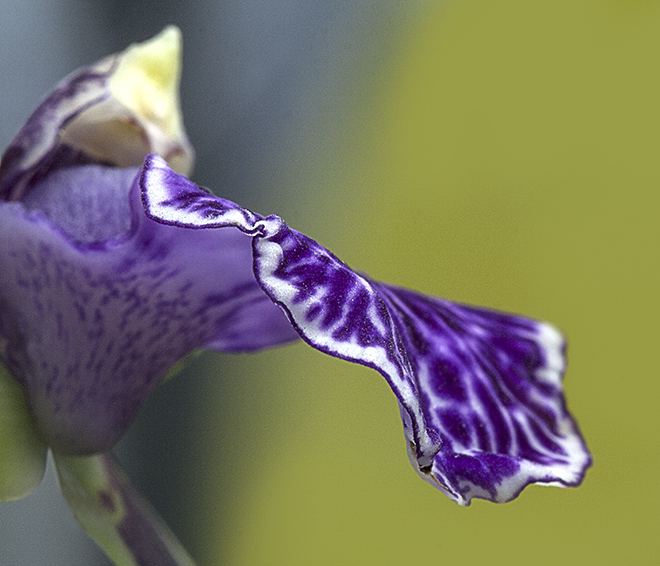 I photographed this flower while visiting an orchid exhibit at the Lewis Ginter Botanical Gardens in Richmond, Virginia this past weekend.